I had first been aware of Malagos Cheeses a couple years back from other articles and being able to taste a bit here and there in random restaurant menus. 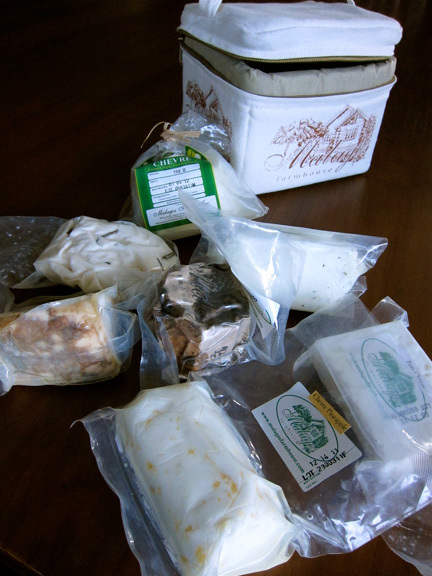 But it was only this year that I got to sample a lot more from a “cheese care package” sent over by a friend from Davao. I was really planning on visiting cheesemaker Olive Puentespina the following week, coinciding with a scheduled trip, and it was a nice surprise to be getting a preview of her products. I thought the cooler package was a pretty novel idea; eliminating one’s worries of spoilage while transporting these precious cheeses by hand. 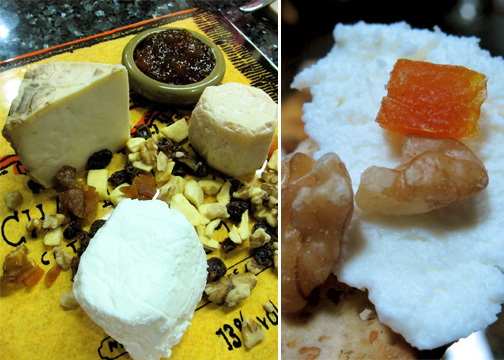 But it was the enticing variety of cheeses and their quality that really impressed me. Seriously, who wouldn’t love to get a kilo of artisan cheeses? Ok, maybe millions of lactose intolerant people out there but you know what I mean. I picked out the Chevre, the Blush and the Blue Pepato to sample first. The Chevre was soft, and slightly crumbly. Very delicate in texture and had that classic tartness. It wasn’t heavily salted and the taste of goat’s milk definitely comes through. The Blush is a semi-hard cow’s milk cheese made by soaking tumbler-sized rounds in Bignay wine (also a Malagos product) before aging. This gives the rind it’s signature reddish “blush” and dried fruit notes. My favorite of the batch was the Pepato; firm, salty (but not overtly), intense and studded with green peppercorns for some explosive bites. It had that slightly ripened aroma yet wasn’t as pungent as longer aged cheeses. The wife and I invited Kitchyart over to help consume part of the stash with some crackers, nuts, dried fruit and fruit jams. Made for a not-too-shabby midnight snack. I sampled the other cheeses over the next few days in some pasta dishes, salads and sandwiches and, though they worked well, I was still partial to the Pepato. Left: Chevre at bottom, wedge of Blush on top left and Pepato on top right. Right: Chevre on a cracker. The Puentespinas are a dynamic family with many agricultural ventures. They’re a major producer of orchids, several varieties of cut flowers as well as cacao seedlings. The miniature pumpkins and gourds you find in specialty stores are probably from their farms. The haricot vert you find in upscale restaurants in Manila probably come from their Mt. Talomo plantation. Which is why it wasn’t unusual for Olive and her husband to acquire about 30 goats a few years back; because they had the space and they thought it would be nice to see some additional animals roaming in the family’s Malagos Farmhouse. But in just three years, 30 goats quickly turned to 100 and the overhead to maintain the animals had become quite considerable. Plus there was a surplus of milk from the goats so Olive had decided to make feta and a kesong-puti-style fresh goat cheese to supplement the upkeep. Her initial experiments were instantly popular and she therefore decided to go beyond fresh cheeses; to also use cow’s milk and incorporate European style techniques. She had help from some people in UP Los Banos in the beginning and a Swiss cheese master later on to hone her craft. Of which the latter’s methodologies she found too rigid. Some totally inapplicable to tropical settings; as starting off with milk at 25 degrees Celsius when the temperature of her facility alone was already at 38 degrees Celsius. So she approached cheese-making like jazz; still guided by tradition but greatly improvising within a certain framework to produce something of beauty. Olive kept a clipping of an article that came out in a Swiss newspaper of her achievements; the writer in awe and bewildered how she could produce cheeses of quality given the conditions. The writer was her Swiss instructor. In her first year, she was making about 3 to 6 kilos of cheese a week. Now on her fifth year of production, Olive churns out about 10 to 40 kilos a week depending on orders. She gets special requests from chefs in Manila for bigger wheels of longer aged cheeses that sit side by side giant wheels of Parmigiano Reggiano during special events. And the city of Davao is quite spoiled that its now quite normal for restaurants to be offering Malagos cheeses on their menus; the Blush is quite popular on every other hearth oven baked pizza. They’re proud to carry the Malagos brand. It’s still considered a small operation though. And while one would assume a one-woman operation would be limited to produce a handful of good cheeses; she incredibly makes about 22 varieties. Olive was generous enough to prepare a cheese platter of her favorites on my visit. Three goat cheeses: Fresh Goat Cheese, Chevre (which I’ve previously sampled) and the Feta Tricolor. The fresh cheese was deliciously soft and smooth. A very mild, clean flavor with a sweet, grassy finish. I love feta and I love chili and rosemary (hence Tricolor); and this combination of fresh herbs and spices work so well with the briny, tangy cheese. 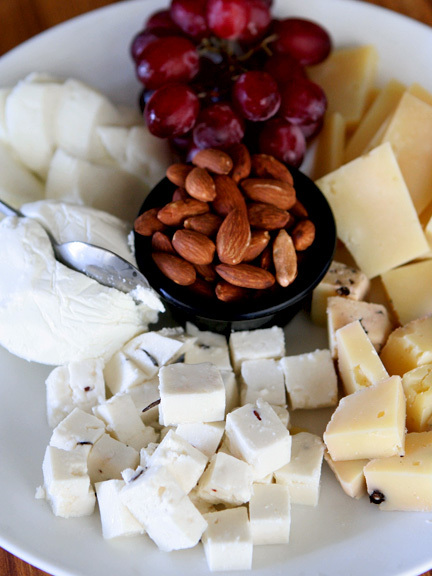 Again the cheeses do not taste too processed or salty which is a sign of not only restraint but freshness of ingredients. The two cow’s milk cheeses she brought out was the Blue Pepato (as I had sampled earlier) as well as the Queso Rustico. I found the Rustico wonderfully sharp; nutty with a nice salty profile as Parmigiano, complete with the crunchy protein crystals. It’s texture was a bit softer akin to an aged cheddar or manchego. She admittedly states that, for now, all the cheeses are tweaked to local palates so as not to overwhelm them with too aggressive “aromas” just yet. With the blues also being ripened for a relatively short period and limited to the rind. But she says that you can further age these at home for a few months for deeper, more complex flavors to develop. Or for the flavors of the goat cheeses to come out more. When Olive says “I love what I do” I believe her. I see the fire in her eyes and feel the infectious passion in her voice. Cheese-making is hard, manual labor and she wouldn’t soldier through the tennis elbows, carpal tunnel syndromes and herniated discs from lifting heavy vats if she didn’t. “You refine technique by building the proper facility for it”, she says. In which this proper facility is being built as we speak and will be operational very soon. Complete with canal systems and walk-in cold storage; maybe even a tasting room down the road. All for a better product at the end of the day. Which only means more quality cheese for us. I think it would be a really good idea to serve Olive’s cheeses alongside the edam (aka Quezo de Bola) over the holidays. Some would probably say it wouldn’t be very traditional; but I say it would definitely make the spread more Filipino. Where to find Malagos Cheeses? Click HERE. Olive’s article, Cheese-making Philippine Style.